Join the discussion on our forums! Come discuss Elementary Reaction over in our dedicated Elementary Reaction discussion topic. Literally a 2 mana Mimic Pod for Elemental Shaman. 2 Mana Mimic Pod if your deck has elemental synergy. Why wouldn't you run this? 2 mana Mimic Pod? Sounds good. 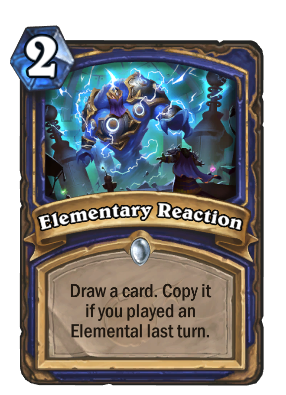 Any amount of Shaman card draw is always welcome, and this can generate some great value in the right deck. I wonder if this might even see play in Shudderwock decks for the chance to sometimes get two copies of Grumble, Worldshaker? Elemental shamans do love it. Seems pretty good. It's a 2 mana Arcane Intellect in a sense. Damn, that card slipped my mind. Definitely a better example since it's literally same effect.